Differentiated Instruction - What is it? Differentiated Instruction - This link contains a list of websites containing teaching strategies, lesson plans, and provides an understanding the basic concepts. Differentiated Instruction - Differentiated instruction is a way to reach students with different learning styles, different abilities to absorb information and different ways of expressing what they have learned. Differentiated Instruction and Implications for UDL Implementation - from CAST, the Center for Applied Special Technology based on the principles of Universal Design for Learning (UDL). Tools and Activities - This section of Teaching Every Student supports strategic learning by offering tutorials, tools, templates, and activities to help teachers put UDL into practice. 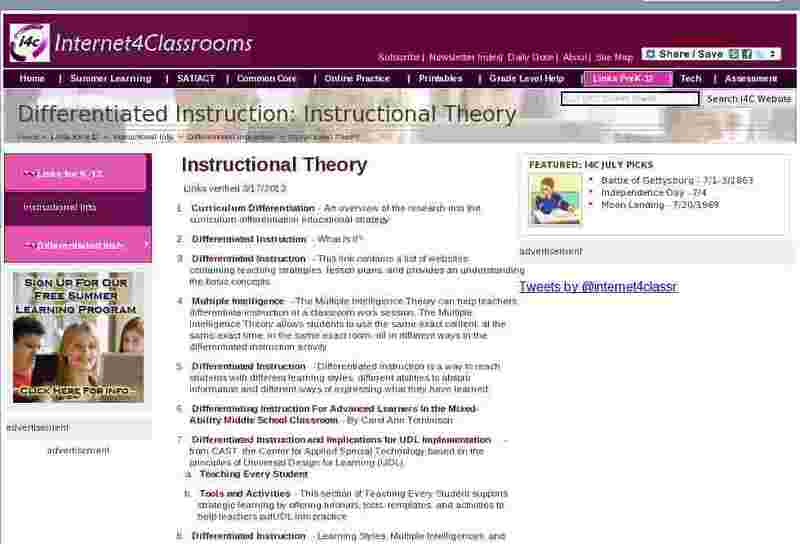 Differentiated Instruction - Learning Styles, Multiple Intelligences, and Differentiated Instruction articles. Mapping a Route Toward Differentiated Instruction - ( by Carol Ann Tomlinson ) Striving to maximize the capacity of each learner. Towards inclusive schools: a study of how a teacher facilitate differentiated instruction. - This is a long, scholarly paper presented at the European Conference on Educational Research, Edinburgh, 20-23 September 2000.